Vladimir Putin says Russia would like to participate in Delhi-Mumbai Industrial Corridor and speed up FTA talks between India and the Eurasian Union. Narendra Modi assures Russia that it remains India’s most important defence partner. India and Russia signed 16 agreements at the 15th annual Indo-Russian bilateral summit, including two concerning the use of nuclear energy for peaceful purposes. In a joint statement, Indian Prime Minister Narendra Modi and Russian President Vladimir Putin said they agreed on a vision for strengthening the India-Russia partnership over the next decade. “Recognizing that the special and privileged strategic partnership between India and Russia has been built on the strong foundation of mutual trust, bilateral understanding and unique people-to-people affinities, the leaders emphasized that the time has come for a significant broad-basing of bilateral cooperation to carry the friendship between the countries to a qualitatively new level,” the statement read. Russia and India agreed on the construction of at least 12 new nuclear power units within the next 20 years, including two new units at the Kudankulam Nuclear Power Plant. The countries also agreed to find a new site to construct a new nuclear plant. At a joint press conference, Putin said Russia would look at participating in the Delhi Mumbai Industrial Corridor project. He added that negotiations for a free trade agreement between India and the Eurasian Union would be sped up. Although the sides did not reach a concrete agreement on the FGFA and MTA projects, Putin said the projects show the strides made in defence cooperation between the countries. 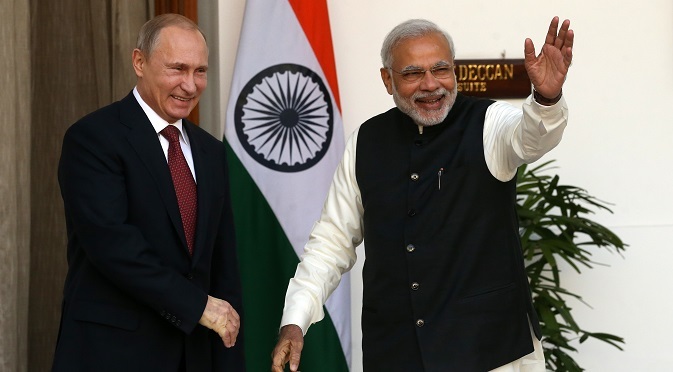 Modi reassured the Russians that Moscow would remain Delhi’s primary defence partner.